This is it. Enjoy this one, top to bottom, bottom to top. 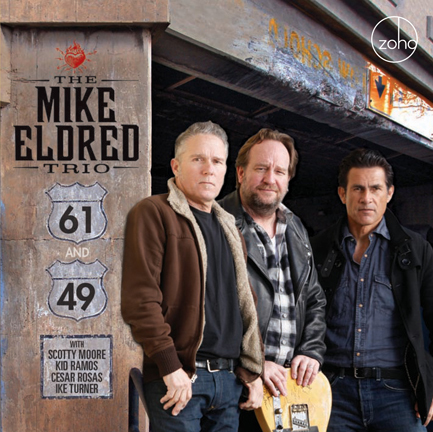 The Mike Eldred Trio make the rounds through a blues-wrapped offering that is certain to satisfy. Rock it!" Jerry got his first professional job playing the drums at age 10. He was playing with Leon Russell at age 21. The list of people that Jerry has played with is mind-boggling! Everyone from Carole King to Brian Setzer, and Dwight Yoakam, and Divinyls, and The Dickies, the list goes on and on! It was while he was playing with the Blasters that he met Mike Eldred. As top blues circuit players around L.A., Angel Eldred, and Bazz were always ending up getting the same call to back up some harmonica player or singer. 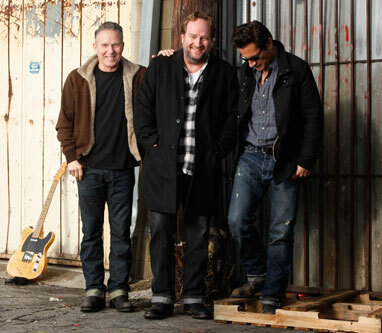 The three always had a great time playing together, and as a result of that formula jelling so well, the trio found themselves playing together more often than not, but usually backing somebody else, not as a real band. It was Angel who suggested that Eldred start his own band. It was also Angel who procured the band’s first studio recording time. Jerry remains the anchor for the trio, holding down the backbeat and the "keeper of soul" both live and in the studio. John Bazz is one of the founders of the Blasters whose impact on roots music and the L.A. punk/new wave scene is legendary. The Blasters were one of a handful of bands that has carried the torch of blues and rockabilly onto another generation. Bazz' approach to the bass is unwavering and relentless. He doesn’t just "play" the notes; he literally pulls them out kicking and screaming. John's basses are tone-tools that are constantly being subjected to a full-frontal assault that usually ends up with several broken strings, knobs, or pickups. It is that passion in his playing that lays the foundation and DRIVE in every song. There is a push in John’s playing that is unmistakable. Other bass players see it and often comment on it. John Bazz is what a bass player is supposed to be. John is always being called for sessions, gigs, and continues to tour with the Blasters when he is not playing or recording with MET. Eldred started playing guitar when he was 14 and has not looked back. Playing in bars, weddings, high schools, and everything in-between, Mike got a call one day from Brian Setzer's guitar tech who had passed Eldred's 4 track demo to Lee Rocker. It was that encounter that began Eldred's professional career recording two CD's with Lee and finally stepping out with his own band. Mike's influences are varied and extreme. From Scotty Moore to Hendrix, there are no barriers to his musical taste. "He's not afraid of blurring lines in American Music. By bending all of his favorite musical styles, Mike has created his own original voice in modern electric guitar playing. HE'S WHAT IT'S ALL ABOUT, BABY!" raved Brian Setzer about Eldred's playing on MET's first CD. Eldred has gained many accolades from not only his peers, but also the press for his "take-no-prisoners" guitar style, and his deep song writing abilities. Mike has had spotlights in both Guitar Player Magazine, and Guitar World. Magazine, and the band's first CD released on Virgin France attracted the French magazine "Guitarist" which promptly promoted the CD "Album Du Mois" or, "Album Of The Month".